Ever since I finished up my Pantene Aqua Light shampoo, my hair has been on a downward spiral. I can’t seem to get anything to work with it for longer than a week. If its not weighing my hair down, it’s making it frizz and drying it out more. I haven’t had that problem for about 3 weeks now though, and it’s thanks to an inexpensive but effective product. The brand is Human Nature or Human Heart Nature whichever way you want to look at it and this is the Natural Moisturizing Shampoo and Conditioner. There’s no “name” of product per se. That is the name! I will tell you that when it comes to natural products, I honestly never expect them to work – few do for me with any lasting memories/effects. I’ve used a few different brands and I will personally say I’m not about to make that switch to go all-natural (kudos to those who do, but its just not me to). So when a product that says it is natural, without all that chemical razzmatazz and is affordable (oh yes it is!) I am mildly surprised at best, when it does what it says, without my realizing it. 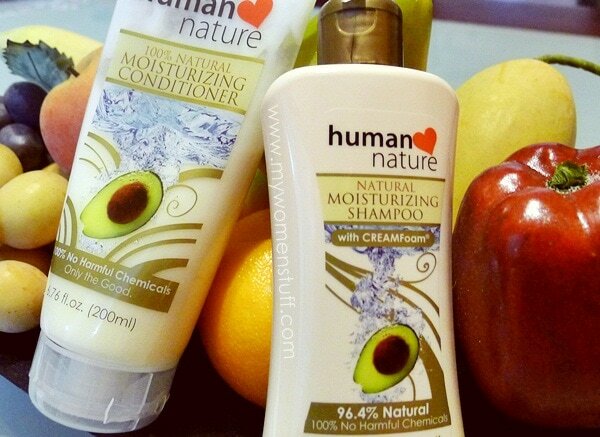 Human Nature is a very affordable brand from our ASEAN neighbour, Phillippines (waves to all Phillippines readers!) that specializes in creating natural based personal care products with no harmful chemicals. The present range isn’t very large but it encompasses most of the products we use daily for face, hair and body and the prices surprise even me! Locally, Human Nature is distributed by DowntoEarth.com.my and their products are available online. The Natural Moisturizing Shampoo and Conditioner is what I’ll tell you about today because for me, it has been the most effective product I’ve used from what I have tried. The Natural Moisturizing Shampoo with CreamFoam (a Human Nature trademarked ingredient) takes some getting used to. The shampoo is very very liquid and feels almost like a watery body lotion. Formulated without SLS, the shampoo doesn’t lather up very much or at all. Personally, I feel that for my short hair, I end up using quite a bit more than what I’m used to because when I apply the product to my hair, it feels like it just soaks right into my hair and I have nothing to wash out! Serious! When I use a little more, it lathers up a little but you will definitely not get that headful of soap suds that you may be used to. I’m used to this happening from natural non-SLS based shampoos so I’m not overly surprised, but I am surprised at the very liquid lotion texture and feel on my hair and it almost feels like I am coating each strand of hair with a protective moisturizing lotion. I do wash it out of course and you aren’t left with a squeaky clean feeling of hair and scalp. My hair does not feel very dry but I do follow up with the Natural Moisturizing Conditioner which I happen to LOVE! This one has a creamy texture without the silicone feel you can expect from most hair conditioners. It again, feels like body lotion except its meant for your hair. I don’t have to use very much for my short hair, and it is interesting to note that although I apply it all the way to my scalp, my scalp does not feel oily thereafter. I use it the usual way – apply a dollop all over my head, leave on for a few minutes and then wash out. Again, it doesn’t seem like a lot of it washes out. Its like everything’s absorbed right into my hair. Very strange observations as you might expect. However, with regular use of these products, I’ve found that my hair actually falls better. It does not look frizzy and voluminous, its not rebellious, I wake up each morning to good manageable hair and if its even possible, my hair actually looks healthy and I’m starting to see a shine! Interestingly, although its a moisturizing shampoo, it does not weigh my hair down at all unlike many others. I’m surprised, because I’ve used both natural and organic hair care before this and they have thus far left me quite unimpressed with long term use. This is the first time I’m actually using a natural based haircare range for longer than 2 weeks and am very happy with the results. Oh and I have to mention the scent. It smells of fruits. It is a fresh scent which has hints of citrus and other fruits like pears that is again, a little surprising, but light on the nose. The scent does not linger in my hair though I wouldn’t mind if it did (it lingers for a little while but by morning, its gone). I have been using this everyday as I wash my hair everyday, and so far, I’ve faced no problems. Oh wait, there is one small problem. My hands. I have sensitive skin on my hands and as with most natural based products, I found that the skin on my hands will start to feel a little dry. It hasn’t started to dry out and peel all over, only on a few fingers, so I think its reached its limit and I can sort of live with it. Just sort of. 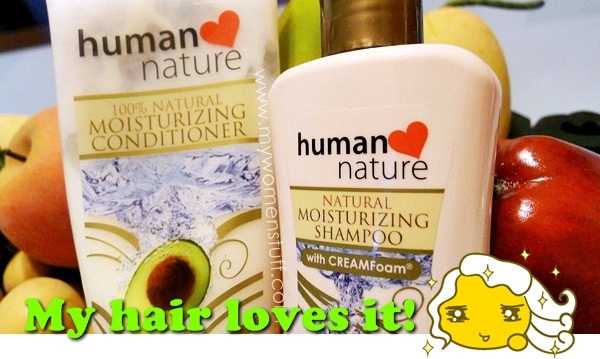 Human Nature Natural Moisturizing Shampoo and Conditioner is an affordable all natural hair care product from this brand which originates from the Phillippines. The shampoo has a very light watery texture which takes some getting used to and does not lather up very much or at all. The conditioner has a thicker cream texture and you don’t need very much. With regular use, I found that my dry frizzy hair has become more manageable, falls better, feels lighter and less stiff and looks healthier. The sensitive skin on my hands do get dry and start to peel but the effect is less than with other natural based hair care products I’ve tried. All in all, I’m seeking to repurchase this product! 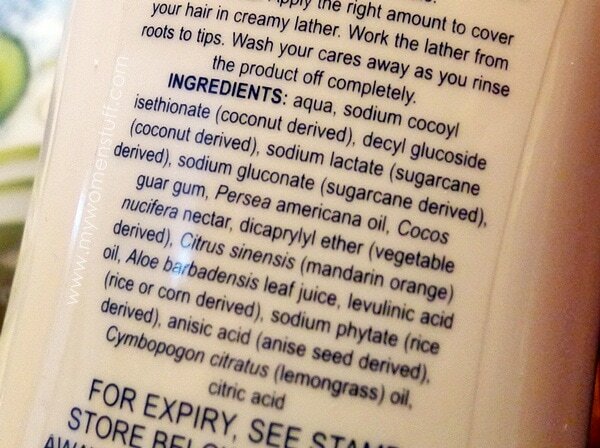 Here are the ingredient lists from the back of the bottles. DIsclosure: Featured products were provided by distributor for consideration. For posting guidelines please read my disclaimer. PREVIOUS POST: By George! A-England’s St. George is truly a legend un-Teal the end of time! I used to be a HH dealer and we use most of their products at home. Most of their body products worked for me except for the feminine wash! 🙂 According to some beauty bloggers, their make up works just fine though I haven’t tried them yet. I personally recommend the Sunflower Oil and is dying to try their deo. Interesting…it does not contain the ingredients I am allergic to! I’m curious to find out if it will work for me. But I do have a reliable shampoo now…unless my curiosity gets the better of me! Yup, it doesn’t lather up – does take some getting used to. The conditioner is pretty good by me. Regular use has helped my hair, thank goodness! Teehee…I just bought the balancing facial care bundle from the store as am having some crazy breakouts recent few months on my forehead all along hairline. Hope it helps with the natural ingredients. Will see. Hi! I’m currently using the Balancing Facial and it works like wonder. 🙂 I used to have blackheads and whiteheads from my hair line to jawline and after using it for three days i swear my face isn’t rough anymore from white/black heads. Love it!!! The sunflower oil is indeed a miracle in a small bottle. Dries my pimples and lightens it. Oh did i mention my skin type is oily/ sensitive? Hope this helps. Hi Carrie, then I hope you find a good alternative in this one – its really affordable too! Its great to know that natural shampoos have helped you. I haven’t experienced that great of an improvement, maybe because usually, my hands hate the product so quickly that I have no choice but to stop using it. This has been one of the longest I’ve used a natural hair care product in a long time 😀 Do you have a favourite brand? I am still trialing actually. I like the tea tree shampoo from Thursday Plantation. The Rosemary shampoo from [A’kin] isn’t bad either~ Now I am onto The Rainforest shampoo from TBS!! 😛 Though I know the ones from Sukin hasn’t worked well for me, despite they are also rather affordable. Wow, sounds good! Ive tried organic/natural shampoos in the past and to be honest, I’ve found them superior than regular shampoos in the sense that it doesnt feel so… BAD on the hair, like it doesnt have any residue. I’ve never heard of this brand but it sounds so good! It is good! 😀 For me at least 😀 Well never being a fan of natural shampoo, its nice for me to find one that I like that natural products fans would like too 😀 Do you have a fave natural hair care brand, Renee? I have never heard of this brand. But my experience with Nature’s Gate was very good, and I would love to try other natural shampoos! I haven’t heard of the brand before. 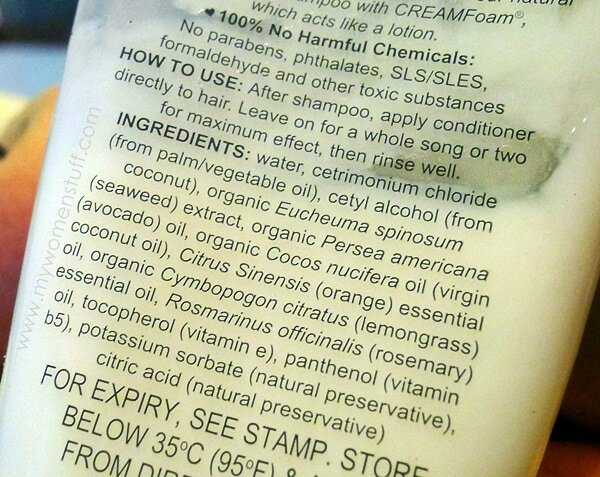 And although I know that SLS is harmful, but still my hair products contain SLS. >.< I never tried any natural hair products before. I'm using Loreal Professional since it's the only one brand that is suitable with my hair. Been thinking to try the Loreal Nature Series. You mean the Moringa Toner for dry or mature skin? They’re still selling it. Although, they reformulated it and changed the bottle design. I’m not aware of its scent since I don’t use it. I have oily skin. Its a Filipino brand actually. We have a distributor here that ships within the country but I’m not sure if they’ll ship to Singapore. I suppose you could contact them and see if they do? My sister is a dealer and she ships Human Nature products to me here in Singapore. You may reach me at 96259667 if you’re interested. hey Paris, a regular reader here from the Philippines (but first time to comment though) 😀 Nice to know this shampoo worked for you. I’m a huge fan of Human Nature! I have yet to try most of their products. But so far, I’m loving their Moisturizing Night Cream and Peppermint Lip Balm. I was quite skeptical with the lip balm at first because it was very cheap and ingredients seem to be simple. But to my surprise, I liked it more than the commercial brands available here. The moisturizing effect lasted longer than my other lip balms. And did I say that it’s very cheap?!? I also like the Original Strengthening Shampoo with Pearl and Aloe Vera. This worked for my hair too — less hair fall for me. Yay! Others swear by the New Natural Strengthening shampoo, but my hair loved the original formula more. Hi Nana, thank you so much for sharing your comment. I’m happy to know the shampoo helped you! I’m thinking of tring it myself because I was experiencing some hair fall and now you’ve convinced me! You should try this company called CENTIFOLIA. It’s an organic French brand which only offers 100% natural products. I’ve tried their shampoo and it’s really good! Not sure if they sell in Malaysia yet or not…but i’m sure they will sometime soon! Oooh! I was given a couple of their products (travel sized) and the conditioner is one of them. I have to go try it soon. I’ve tried 2 of their products thus far. I can’t bear the smell of The All Natural Hydrating Lotion in Sweet Indulgence – too sweet and cloying. But I am in love with the All Natural Tinted Lip Balm. It works well to keep lips from chapping, smells fantastic and it gives a very natural tint on the lips as the colour tends towards red rather than pink. I think that pink tints make my lips look even paler. 1) Balancing Facial Wash and Toner – I still have breakouts, but I’ve only used this for a few weeks. I’m giving it more time and see if my skin improves. 2) Sunflower Beauty Oil – I use this on the dark spots on my legs (the ones left after scratching mosquito bites), and it does lighten them up. 3) Perfect Coverage Mineral Foundation – It’s concealing effect is still not perfect but it’s so light on my face and it doesn’t cake up. 4) Tinted Lip Balm – I’ve completely neglected my other lipsticks because of this! It moisturizes my lips as well so no need to apply lip balm first. 5) Mineral Pressed Powder – I use this to touch up the oily areas on my face (I just really have oily skin!). The downside is that when almost of it is used up, it starts to crack (this is because of the absence of preservatives), and goes to waste. So careful, careful, careful. 6) Sunflower Cleansing Oil – Great in removing make up and has this nice scent. I also use this to get rid of blotches of wax left by wax strips, and doubles as a skin moisturizer. 7) Body Butter Cream – Consistency is thick so it takes time to be absorbed by the skin. Skin is moisturized all day. 8) Healthy Lotion – Easily absorbed and light on the skin. Moisturization doesn’t last as long as the body butter. 9) Hand and Foot Salve – Consistency is thick as well so takes time to be absorbed, but quite effective in softening calluses. 10) Feminine wash – Very light. No irritation, itching or foul smell when using it. 11) Deodorant – Doesn’t stop my sweating but the only one that lightened my dark underarms and softened the chicken skin. Prob though is that recently, I think my pits started smelling funky. My bf says they smell fine. So I’m not sure if it’s just me being paranoid or my pits “rejecting” the product. 12) Body Scrub – I like how the beads are not very rough and that after scrubbing, my skin doesn’t dry out.